The easiest way to carbonate beer. This is a Cornelius keg lid with built-in carbonation stone! Move the lid from keg to keg to carbonate as needed. 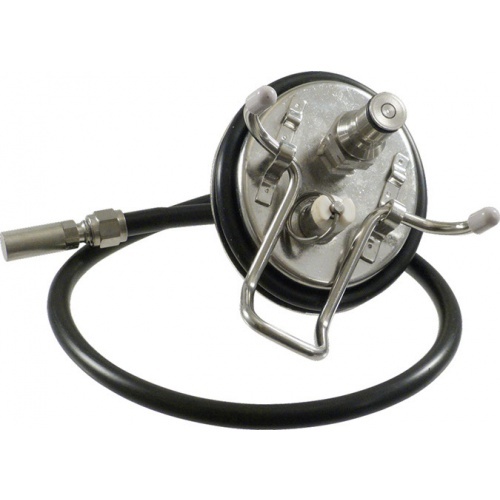 Allows you to force carbonate quickly using the attached .5 micron stone with the portability of being able to move the lid from keg to keg. 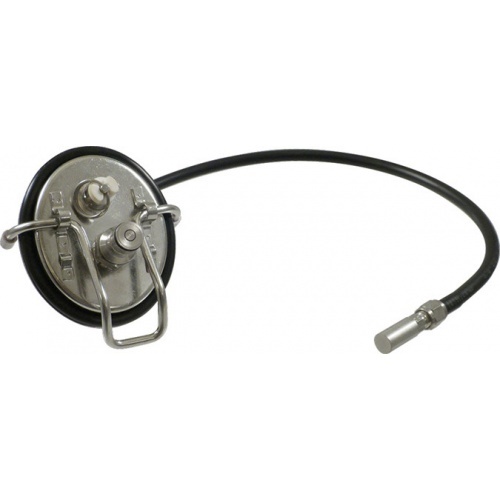 No more hassles of trying to attach and unattach line from the "gas in" dip tube. Simply connect your gas quick disconnect to the included fitting on the lid and allow carbonation to begin. Sometimes also called a carbonater. We constructed the lid by welding on a 1/4" barb to the underside of the lid. To that we attached 2' of 1/4" ID tubing that attaches to a .5 micron carbonation stone on the other end. The flexible tubing, as opposed to rigid tubing, allows the lid inserted into any cornelius style keg. The top of the lid has a "gas in" ball lock body connect welded in place that works with the KEG710 and KEG730 gas quick disconnects. 1. Preboil the stone for 2 to 3 minutes before using. This assures you that your stone is sterile and any residual oils have been boiled off. 2. Sanitize the whole keg lid before submersing into your keg filled with beer. 3. Set your PSI on your regulator to 3 to 4psi and attach your gas in fitting to the body connect on the lid. Leave keg at this pressure for 1 hour. 4. Raise your pressure 2PSI per hour until you reach 10 to 12psi. Leave it at 10 to 12psi for 24 hours. Pour a pint and test the carbonation. 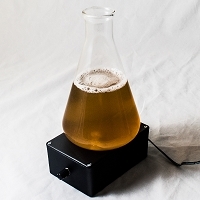 If you think your beer needs more CO2 leave for another 4 to 6 hours and have another pint. 5. Remove carbonation lid after carbonation level is satisfactory. Return original keg lid for long term storage.